I love Texas road trips. When I was young my dad would drive the family everywhere. In a single cab 1970 Ford pickup. He bought the truck “brand new off the lot” and was very proud of it. He added aftermarket air conditioning up front and drove it the rest of his life. It was the only new car mom or dad ever bought. He maintained it impeccably (he was a mechanic by trade) and even repainted it a couple of times. I never remember the truck breaking down on us. A few years after he passed away I went out to the back of the house to do a little maintenance on it. I’ll never forget how every bolt and every part was easily removed, even the brake drums which are notorious for needing some nudging. It also fired right up with a jump start. An amazing thing for such a tired old truck that hadn’t been touched in years. So I grew up on road trips. Mile after mile of asphalt rolling underneath you. Throw in a few barbecue joints and I really dig road trips these days. With my crazy nature it is easy for “a few” to become “many” and for the roadtrip to turn into a rolling feast of Texas barbecue. My wife and many of my friends top out at around three barbecue stops per day. Anything beyond that and not only do they not enjoy the amount of food, but they also get bored. Another point of note is that my wife is about half my weight so she can’t chow down at the same velocity as myself. That often means leftovers, because I hate to throw away good barbecue, and high costs of meals. It’s hard to find folks that enjoy exploring texas, eating at 4-5 joints in a day, willing to drive for hours just to get to a single stop, and who are good company. In Scott and Houston Fed I found a couple. In fact, on our last outing we stopped at nothing other than barbecue joints and gas stations and knocked out five joints in four cities, in twelve hours. If they complained they weren’t saying it out loud and although we went off topic a few times we talked a lot of barbecue during the twelve hours we spent together. Check out Scott’s blog at Texas Pit Quest and Houston Fed’s Blog here. Our original plan was only four stops. 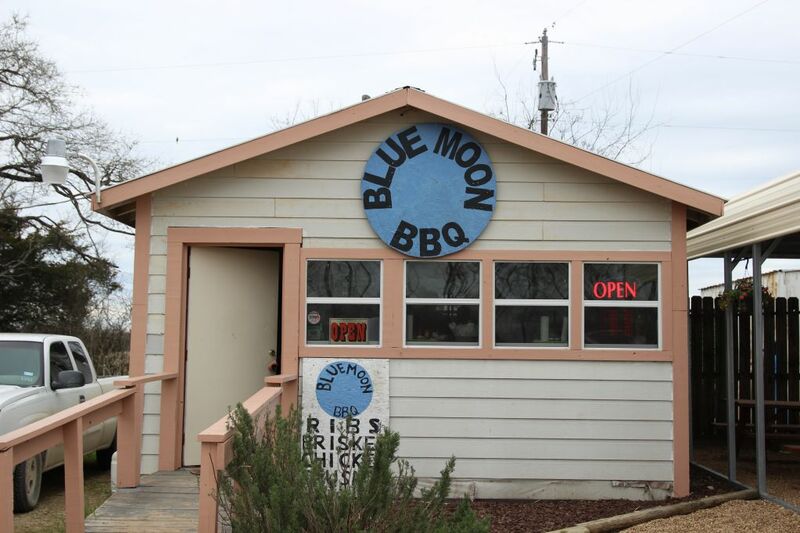 We would begin the day at Blue Moon BBQ, a tiny place well off the beaten path on Old San Antonio road North of Houston. I have been watching their twitter feeds show some good looking meat. Daniel Vaughn had been there once a couple of years ago but encountered some dry brisket. 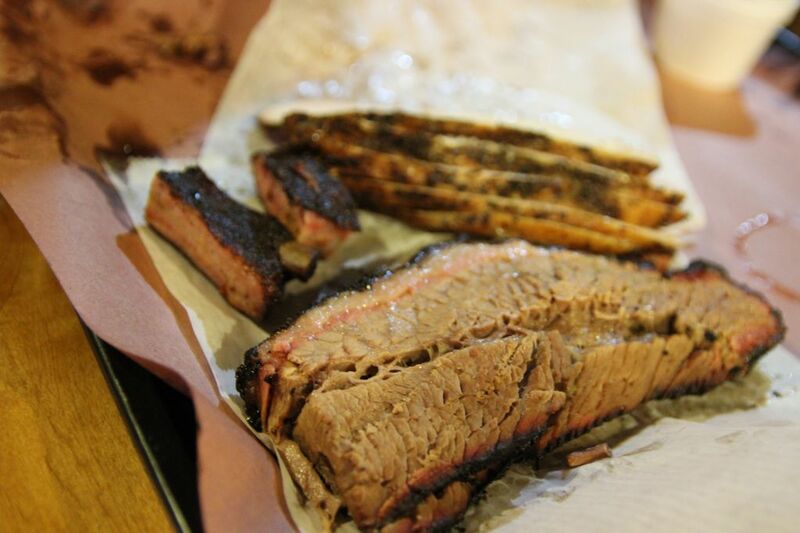 He was provided superior slices of fresh brisket before he left, but the rating he gave was only three out of the six stars on his original blog ranking. This was before his ascension to BBQ Editor at Texas Monthly, his book, and the included notoriety. I would think that many joints recognize him quickly and prep accordingly these days. I can even imagine his picture is pasted behind the counter at a few places. 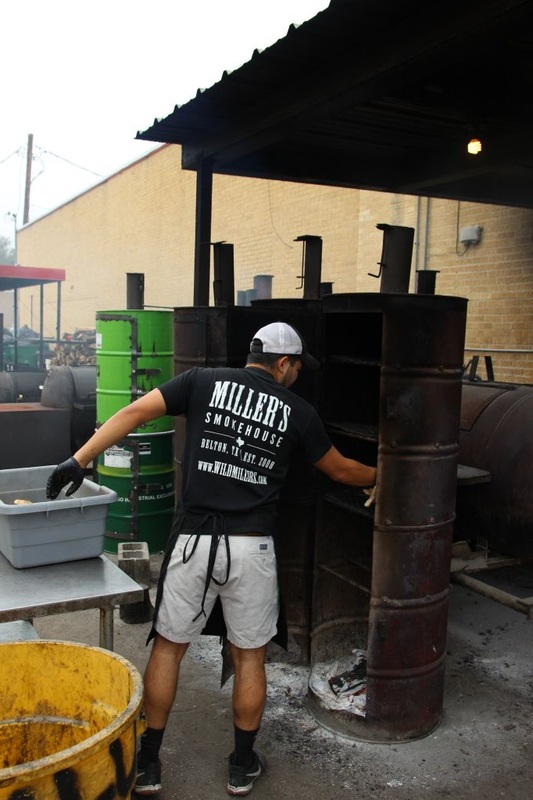 Our second stop would be Miller’s Smokehouse in Belton. 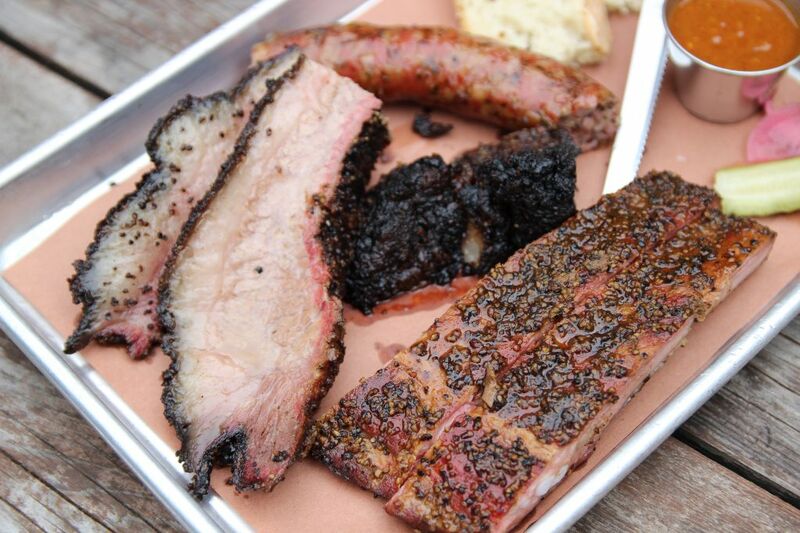 A TMBBQ top 50 joint, I had a great visit last year after visiting Franklin Barbecue earlier that day. I’ve wanted to get back but I haven’t been near Belton since that first trip. 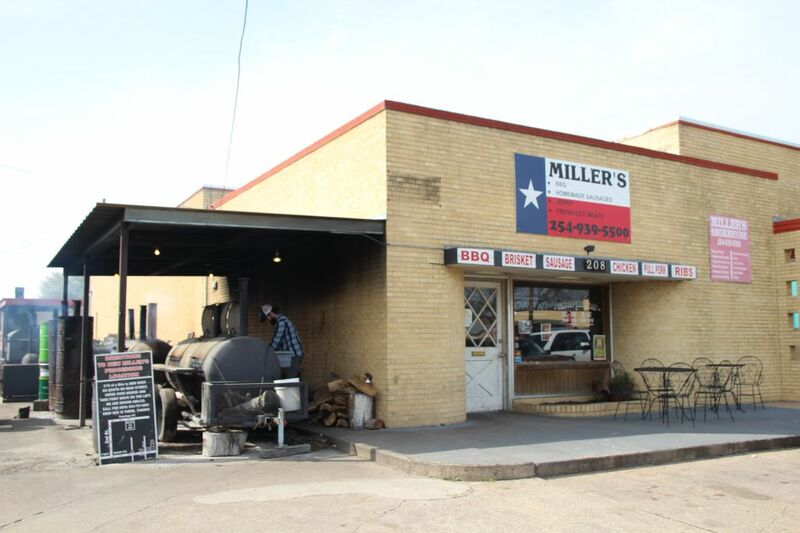 Miller’s is a small family owned and operated joint that is churning out some great barbecue and desserts. Following that we would head down to Austin to hit Freedmen’s bar. I’d been there before and had top 10 quality barbecue but Scott and Houston Fed had not so I was excited to turn them onto such a good establishment. Freedmen’s didn’t make the Texas Monthly top 50 because it hadn’t been established for a long enough time prior to publication, but I can easily say it is in my own top five. A little different from most in that Freedmen’s is a bar that also serves barbecue and is located near the University of Texas which provides for a colorful mix of patrons. 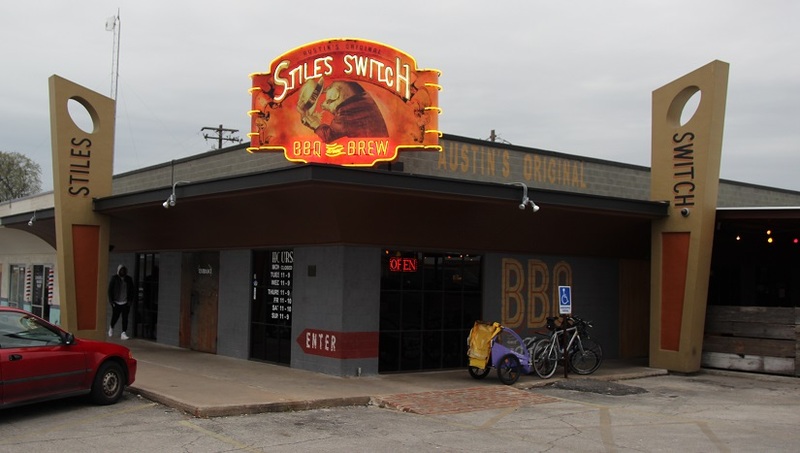 Our final barbecue stop would be Stiles Switch BBQ and Brew, another TMBBQ top 50 but I had only previous visit so I wanted to go again. With the exception of truly awful joints where I don’t care to visit more than my initial experience, all others I give at least three trips before making up my mind. Stiles certainly was deserving of more attention. Photos of their meat, and reviews from some of my friends warranted another visit. We had planned for around ten hours of travel and met up at 8:45 am on Saturday. This was late compared to most of my road trips, but it was less than two hours to our Blue Moon which opens at 11. As I headed to our meet up location, I realized we were going to be a little early to our first stop so I checked Kreuz Market’s website for their Bryan, Texas location and figured with their 10:30am opening we could stop by since it was literally on the way. The guys agreed to an added stop and we made a deal that we would just have a few slices of brisket and a sausage to kick off the day. When we arrived in Bryan we met pitmasters Marco Oglesby and Lee Jasper. As the fresh meats came off the warmer we couldn’t control ourselves. 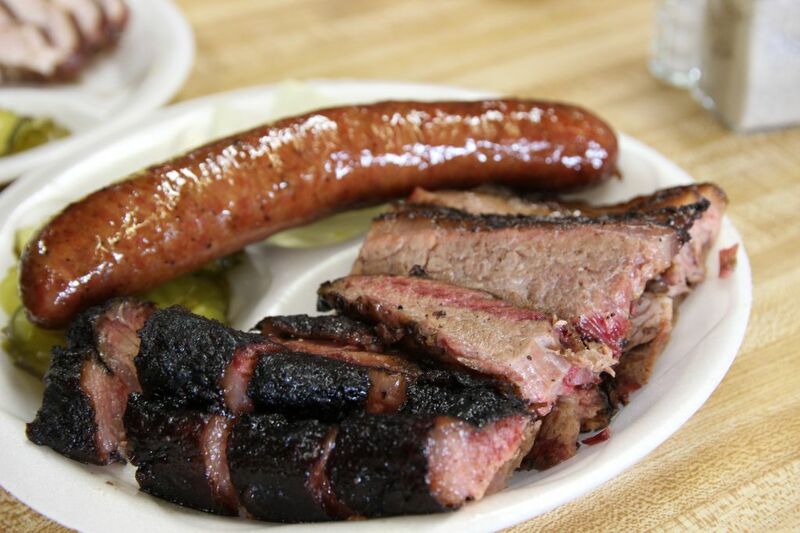 We ended up with both lean and moist brisket, sausage, a pork rib, and a beef rib. The brisket was great. Although the rub’s ratio of salt to pepper is higher than my preferred mix, it does work well. The pork rib was also good, and the sausage had a nice snap and spewed juice all over the table when I bit into it. That’s a good thing to me! They’re doing great stuff out here, and for now the lines are short. It’s a great option for those in Houston who want a little road trip but don’t want to head down to Lockhart. 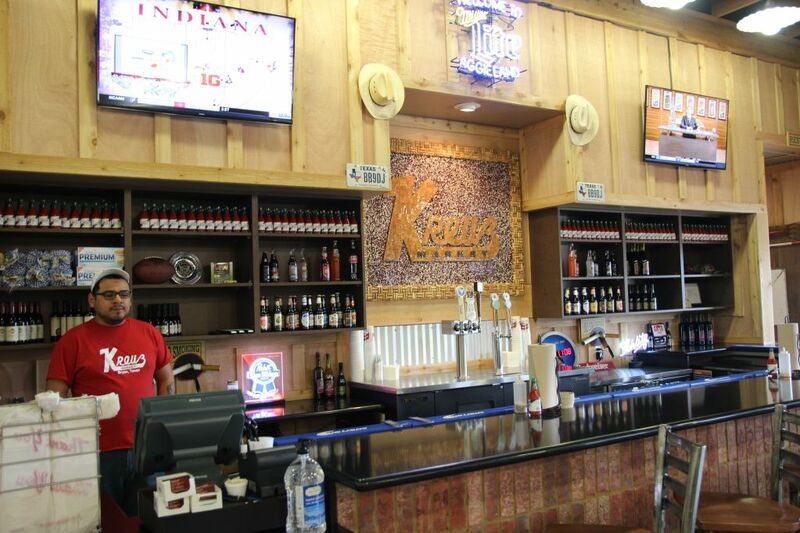 The Bryan location also has a full bar, which I’ll be checking out on my next visit. We said goodbye to the staff and hit the road for Hearne Texas. Or Edge Texas. Or somewhere along Old San Antonio Road (OSR). I knew the location would be sparsely populated but we drove right past it. Seven miles later I did a u-turn and on the return we spotted Blue Moon BBQ sitting off the road a bit at the corner of OSR and Macey road. I don’t recall a sign at the roadside, but the primary guests here are locals and oil industry employees who are familiar with the location. We all had a little nervous anticipation as we opened the door. While research and reviews pointed to a good potential experience little roadside joints this can be a crap shoot. We were greeted with a friendly staff and Toni Moon took our order. 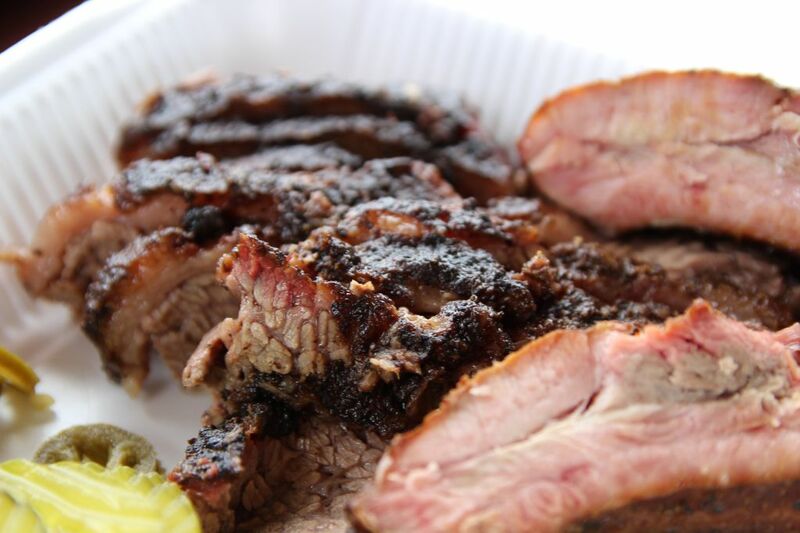 We ordered brisket, ribs, the cowboy cornbread, a couple of stuffed bacon wrapped jalapenos, and a bacon brownie. The brisket was moist and well cooked; where the slices don’t fall apart when lifted but give way with a slight tug. At $13.45 a pound it’s a great deal and basically pays for the added gas needed to get out to them. The rub really intrigued me. Between the brisket and ribs, every once in awhile I’d inhale a spice that struck me as familiar but I couldn’t pinpoint it. When quizzed, Toni smiled and shot down my guesses of saffron, turmeric, or cumin. 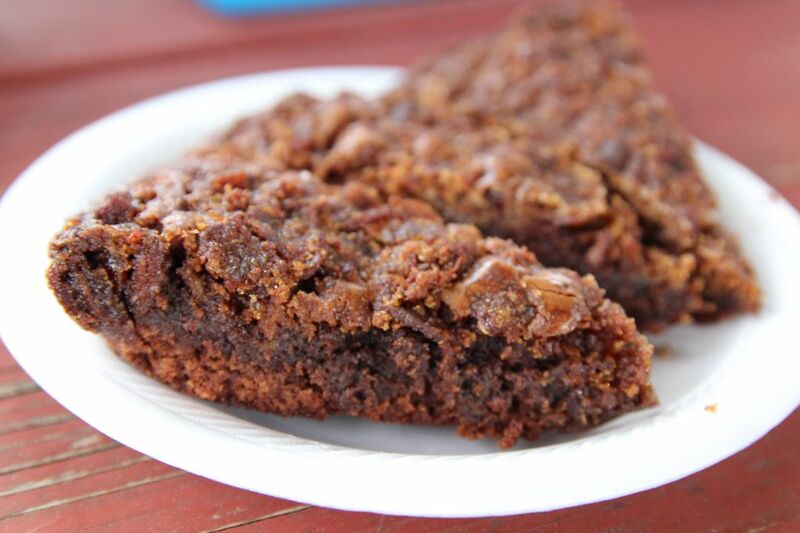 The ribs were also good, but the cowboy cornbread and bacon brownie had us talking the most. 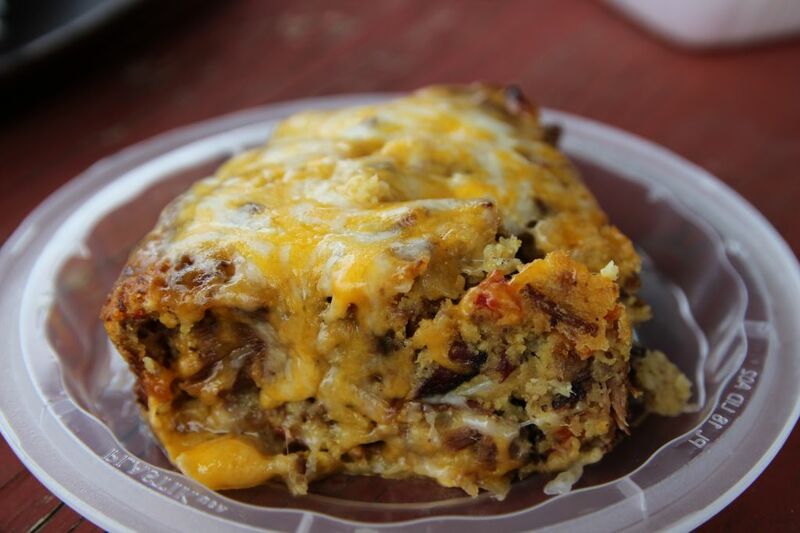 The cowboy cornbread is cooked in a cast iron skillet and consists of cornbread, brisket, tomatoes, chilies, and onions but then covered in lots of gooey cheese. Its enough that I would consider it an entree and not a side dish, but I would assume a lot of burly oil workers think otherwise. Many times, bacon is faddish and used merely to induce purchases because “bacon makes everything better”. Bacon pieces on a cupcake, in a milkshake, or in a sundae is just stupid really, so we were all taken aback when the bacon crumbles baked into the brownie as a crust paired very well with the sweetness. I was expecting something like a strip of fatty bacon slapped on top of a brownie but this was more akin to salted chocolate, with a nice balance of sweet and salty. We each bought one to take home. A little over an hour and a half later we rolled up to another family owned joint, Miller’s Smokehouse . Dirk Miller and family run the joint and we counted 9(!) pits; 4 vertical drum smokers and 5 offsets. Even though it was 2pm the line inside was to the door, this little place stays busy. It moved quickly however and we made our order of brisket, turkey, and sausage. The turkey was flavorful and the brisket was moist and well rendered; we were at three-for-three on the day so far which was making for a great trip. Extra points go to any joint that can continue to crank out fresh brisket from 2-4 pm which is what I call the barbecue dead zone. Dusty Miller told us they pull briskets off the smoker throughout the day to deal with the crowd which of course makes sense but can be hard to time properly. 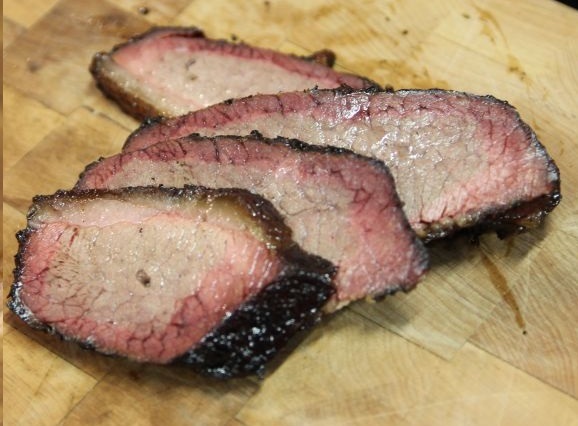 He also mentioned that some of the briskets they’ve been getting lately have a thinner than usual flat, which makes it even more difficult to produce good brisket. 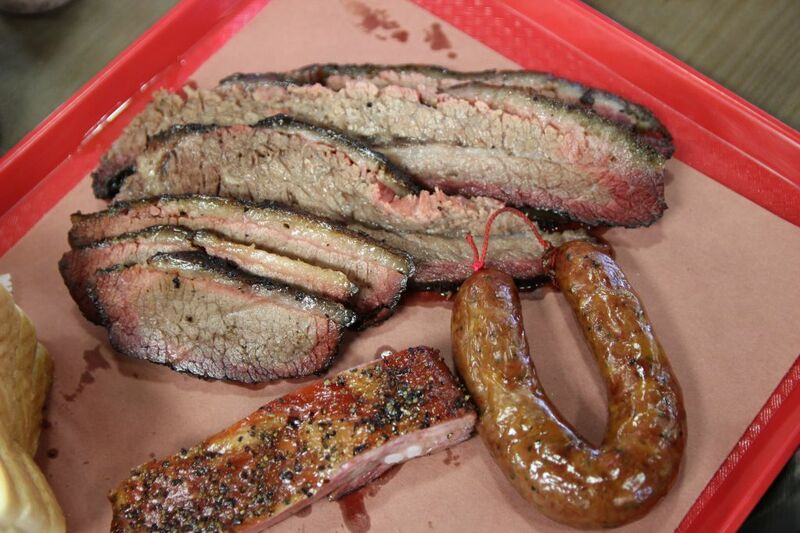 TMBBQ has an article with a photo showing the comparison of these skinnier briskets and the reason why they are being cut that way. Miller’s still does meat processing and they make three types of sausage in house. The regular sausage was ok, but we really liked the jalapeno cheese and the hot link. My favorite was the jalapeno cheese. I remembered my first visit included a great dessert and I had forewarned my compadres but we couldn’t resist. Dirk’s wife Lisa makes the desserts and the one’s I’ve had have been outstanding, including on this day. The Hurricane Cake was delicious, a chocolate cake with cream and a layer of pecans on the bottom, and every bite was as good as the first. I bought one to take home and show off. Belton isn’t a far drive from Austin and I highly recommend making the trip! From Belton we fought traffic and took I-35 and MoPac down to Freedmen’s. While the tiny parking lot is in the back, if you enter from the front you wouldn’t know the establishment churns out some of the best brisket in the world. Located in the heart of the University of Texas it sits close enough to frat houses that while sitting on the patio we listened to live bands, cheers of drunk youth, and the occasional lively patron who wandered in from the street. The cast of characters we spotted included one with ripped off sleeves and a cherry red face from a day of partying. The building was erected in 1869 and features a full bar up front but it’s out back where the barbecue is smoked. Pitmaster Evan LeRoy works his magic in a smokehouse in the parking lot. From this nondescript little space comes some of the best brisket I’ve had. It starts with the bark, heavily peppered and crisp yet simultaneously moist; its great stuff. Past the bark the moist interior and well rendered fat make for a great flavor experience. The pork ribs had plenty of pepper as well but also a slight hint of sweet. I actually ate some of the pickled red onions which packed a nice vinegary punch. We split a banana pudding to finish off the meal but the star was easily the brisket, especially considering we had eaten around 4pm, in between lunch and dinner rush. Back on the road it would be our shortest distance between joints as we headed over to Stiles Switch, a TMBBQ top 50 joint. Austin has a few good options for dinner barbecue and this offered us a combination of early dinner and craft brew so our hopes were high. We hit the front door at a little after 5:30 to a bustling dining room and a welcoming staff. We had paced ourselves surprisingly well throughout the day, skipping most side items and trying not to gorge on proteins. We were still reserved in our ordering, though, and ordered turkey, brisket and a sample bite of pork ribs. The brisket was a bit of a paradox. The top half of our slice off the point was well rendered and held moisture but the half below the vein was dry. I try to give joints a little leeway if I hit them between rushes and I’ve only been here twice now so I won’t judge just yet. The turkey was good, and we washed it all down with some really good Live Oak Brewing Big Bark which paired very well with the barbecue. By the time we left the dining room was nearly full and the line stood with about 15 people ready to order. I’ll be back and will try to time it closer to the lunch rush. The three hour ride home was a little quieter than the peak of the day as we turned over thoughts of the day; what was our favorite spot of the day, our biggest surprise of the day, and where our next road trip would take us. Tags: Blue Moon BBQ, Freedmen's Bar, Kreuz, Miller's Smokehouse, Stiles Switch.